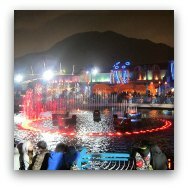 Ocean Park Hong Kong has transitioned from "a good place for a day out" of the city to a truly "don't miss" and "must do" attraction in Hong Kong, specially with the kids. 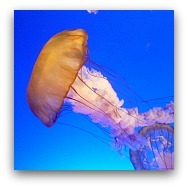 As the name suggests, marine life is a big part of it, but beyond the wonderful sea life exhibits including a World-class Aquarium and one-of-a-kind exhibits like the Chinese Sturgeon tunnel, Ocean Park has also branched out to include other rare and endangered animals like Giant Pandas, Red Pandas and the Golden Snub-Nosed Monkey. To round up the entertainment, it also offers an array of shows, rides and roller coasters. There is truly something for everyone in the family. 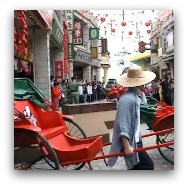 Prior to the opening of Hong Kong Disneyland in 2005, this was pretty much the only game in town when it came to amusement parks geared for family fun. Back then, Ocean Park was a "nice" place to spend a little time, the Cable Car to the Summit, (then the "Headlands") was a prime draw, and the kids really went for the rides. Now, however, the little bit of competition from the Disney Park has helped raise the bar and the changes we are seeing are just phenomenal. Ocean Park embarked on a HK$5.5 Billion Master Redevelopment Plan in 2006, the results are now highly visible and the improvements keep coming. There are now many projects under development including a hotel and water park complex soon to come. 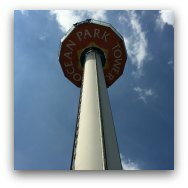 While the Cable Car and the Rides are still a big attraction, there is so much more to Ocean Park now, you can easily spend the whole day and more to do it justice and the changes, improvements and renovations will keep coming so you can visit again and again and there will always be something different! Exploring the Park, what is where? 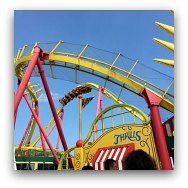 Ocean Park Tickets, can you get discounts for Ocean Park tickets? 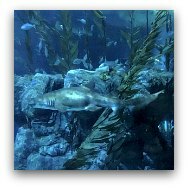 On our recent trip with grandma, grandpa and the kids, these were voted the favourite attractions for our group of ten with ages ranging from 8 to 81. The boys could have spent the whole day at the roller coasters and water rides, the girls at the Grand Aquarium, grandma and grandpa thouroughly enjoyed the Cable Car ride and the great views from it. 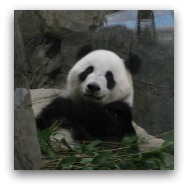 We all agreed that the Giant Pandas were just too adorable, they were a real treat for all of us. 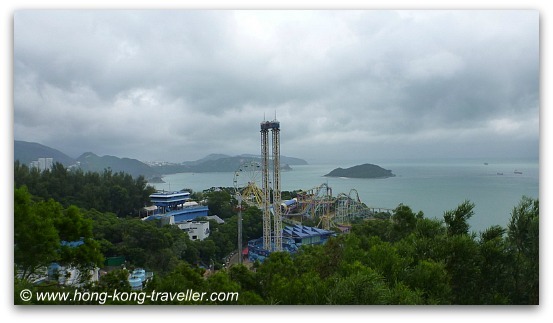 Exploring Ocean Park Hong Kong: What is Where? 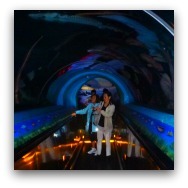 While most of the Roller Coaster and Rides are located in the Summit area, the Marine Life and Animal Exhibits are spread throughout both sections. 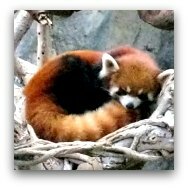 Here is where to find your favorite animals. Food, snacks and shops are also found in both sections of the park. If you have little ones, you will likely spend a lot of time in Whisker's Harbour in the Waterfront. If your group includes teenagers, prepare to spend most of the day at the Summit! Be sure to get a Park Map at the entrance which also contains the show time schedule and start exploring! What's at Ocean Park's Waterfront? Ocean Express Waterfront Station, see Getting Around the Park below. 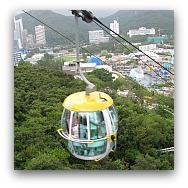 An attraction in itself, makes the 1.5km ride that connects the Waterfront with the Summit in about 15 minutes. There are magnificent views of the Aberdeen Harbour and the surrounding islands from this amazing ride. 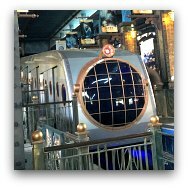 One of the newest additions to the park, this is a "submarine style" train with similar technology as the Victoria Peak Tram, it whisks visitors back and forth from the two sections in 4 minutes. 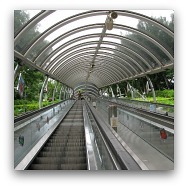 It is the second longest in the world, (after the Mid-Levels Escalator System, also in Hong Kong) it connects several sections in the hilly side of the Summit in the Adventure Land area. 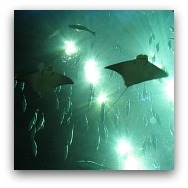 For more on Ocean FasTrack and list of attractions included. When it comes to food and drink at the park, the options are many and varied, from casual fast-food choices, to fancy sit-down restaurants in classy surroundings, and offering a range of food from Western to Asian dishes. You should be able to find something to fit your taste and wallet. 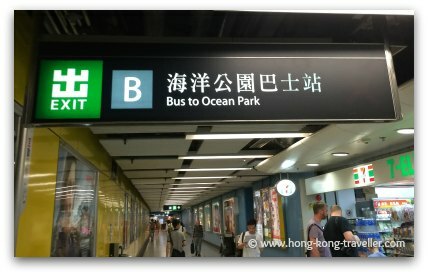 Getting to Ocean Park is easy, there is a special non-stop public bus that goes direct to the park. You take Bus 629 from the Admiralty MTR station, follow the signs for the "Bus to Ocean Park" exit B. Depending on traffic, it will be approximately a 30 minute ride. 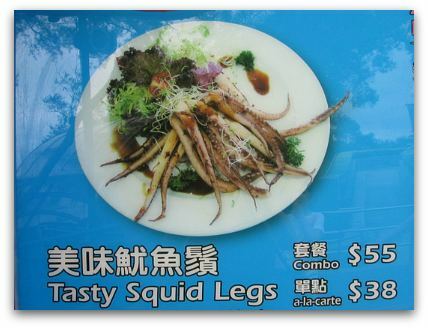 and don't forget you can use your Octopus Card for the bus fare. The new MTR South Island Line is in operation! It now takes 6 minutes from Admiralty to the Ocean Park MTR Station. Fare is HK$5.50 for Adults, HK$3 for children. Don't forget you can use your Octopus Card for the bus fare and MTR fares, which will save you a bit. 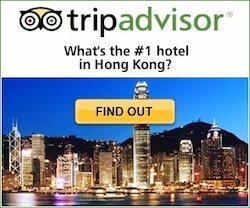 Private one-way transfers from your hotel to the main entrance of Ocean Park costs US$ 54 from Kowloon and US$ 49 from Hong Kong Island. 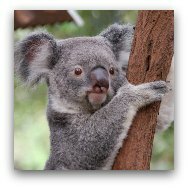 This is a great option if you have a small group as the transfer price is per vehicle which accomodates up to 6 people. 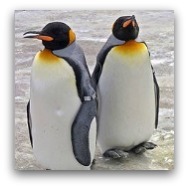 For round-trip transfers you need to book two packages. Leave the arrangements to the guides and enjoy a fantastic day at the park with this tour which offers round-trip transportation by air-conditioned coach, admission ticket, and pickup and drop-off from centrally located hotels. 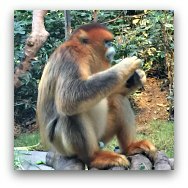 Ocean Park Tickets - Can you get Discounts? 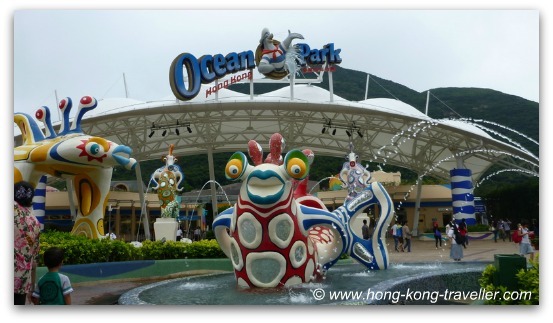 Entrance to Ocean Park Hong Kong is HK$480 for Adults, and HK$240 for children 3-11 and includes all the facilities and attractions except for skill games and coin operated games. 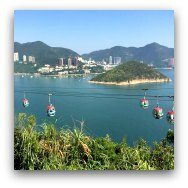 There are unadvertised discounts at the gate when you present tickets to other Hong Kong attractions like the Peak Tram or Peak Tower. Doesn't hurt to ask. My friend got a HK 25 discount with a Peak Tram ticket. Buying your tickets from any CTS (China Travel Service) office will score you some discounts. We got our tickets at the CTS at the Airport (there is a counter at the Arrivals Hall) We got a discount of HK40 per adult and HK20 per children but discounts vary depending on the season. Tickets must be paid for in cash. Another advantage of getting your tickets in advance is that you avoid the lines at the ticket counters at the entrance. You can also buy tickets at some of the major MTR stations for a 10% discount. Buy tickets online through Klook.com a consolidator of transportation and attraction tickets. You can present either a printed or an electronic voucher for this activity, convenient if you are on the go. Prices for adults HK480 HK404 US$52, children HK240 HK$210 US$27. This is one of the best deals available plus you get to skip the line at the entrance! 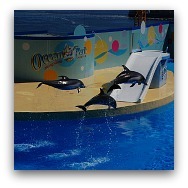 »» More Info and Booking Ocean Park Discount Tickets. It is also possible to buy Ocean Park Tickets at all 7-Eleven stores in Hong Kong, although not discounted, it will certainly save you the line at the entrance counter. The six-storey 470-room Ocean Park Marriott Hotel expected for late-2018 will be located at the resort's main entrance. A central courtyard will include a themed lagoon, children's play area and outdoor dining. Another hotel to be built in the Summit side of Tai Shue Wan, The Fullerton Hotel @ Ocean Park, is expected to break ground in 2017 and be completed and opened to public in 2021. 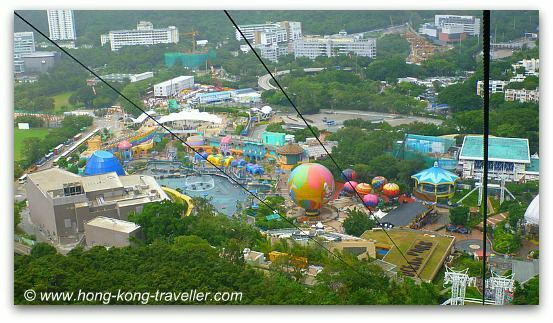 And a humongous Water Park Complex, Tai Shue Wan Water World, is planned for late 2019. It will feature indoor and outdoor facilities, man-made beaches, multiple water slides and wave pools, entertainment stages, and the world's longest leisure river.